Here again a small write-up on personal finance, let’s discuss a bit about assets today. Assets are good. Liabilities, bad. Hopefully, you have more assets than liabilities. If not, you probably need to back up and get some of your basic finances in order. Once you get that taken care of, get back to this discussion which is about what are the best types of assets and where should you be investing your time & money? I’ve decided to break it down into three categories and talk briefly about each. In my opinion, this is your top priority. Productive assets generate or “produce” a return for you. Productive assets work for you. Productive assets might be ownership in a company, cash-flowing real estate, a cash-generated online business, etc. Productive assets are the key to becoming wealthy. Hard assets typically refer to things that have intrinsic value. Hard assets are the opposite of paper assets of which we’ll discuss next. Common forms of hard assets are like diamonds, oil, gold, silver, precious metals, land, etc. You could also add things such as guns, ammunition, food, water, shelter, etc. 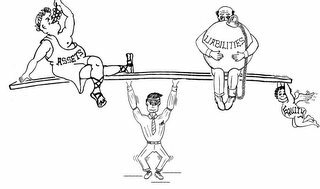 Unfortunately, most people are weighted much too heavily in paper assets. Paper assets seem to be fine, but they can be exposed in a financial crisis like we saw a couple of years ago. Paper assets might be stocks, bonds, currency, money market accounts, etc. Paper assets require a functioning financial system so if the system goes down, typically the paper assets will go down with it. A financial collapse might impact the overall economy and hamper the values of productive & hard assets, but typically these will hold up better than paper assets. If you’re young, you might not have much capital to invest into assets. If you’re young, you do have time and energy, however, and you need to allocate this appropriately. I’d encourage the productive asset area. Neither asset category is a bad one, but again, most people have only paper assets and nothing in the other categories. Caveat Emptor: The above views are not recommendation and keeping all eggs in one basket is not advisable. « Has the Motive for M&A changed with the Time ?